Whether you want to transform the seldom-used garage into a studio or other space, insulate a newly built addition with a garage or have any other need, look to our experienced team. Contact us online or call (256) 715-4061! Lower home heating and cooling bills: You might not realize it, but if your attached garage isn’t insulated, you could be losing a lot of heat from your home in the winter. The opposite is true in the summer, when heat from outside finds it easier to infiltrate your home (if the garage is not insulated). After all, living spaces are most often positioned directly above or beside the attached garage, meaning it’s important to keep the temperature in the garage as comfortable as possible for home energy savings. Improve comfort in the garage: If you use the space for something other than parking cars, insulation is important for staying comfortable. The garage is a great place to work out, enjoy your hobbies or set up a home office. But this is only possible if the garage is insulated. Allow for heating and cooling: If you plan to condition the space, there are more benefits of insulating the garage. A space heater makes the garage comfortable even on chilly winter evenings, while a portable air conditioner cools the space on humid summer days. Garage insulation makes heating and cooling possible while providing substantial energy savings. Reduce outside noises: Sound control is particularly important if you live on a busy street or near a major intersection. If you spend lots of time in the garage, insulation helps reduce the noise coming from outside. If you have an attached garage, insulation even helps keep outdoor noises from entering the main living space. Enhance the interior space: You might not care what the garage looks like from the inside if you only store your car there, but if you use the space in another way, a more attractive interior may be a priority. American Insulation installs various materials—from spray foam to fiberglass and more—and can help you determine the right insulation solution for your garage space. If you need more insulation for your garage and/or home in northern Alabama, make American Insulation your first and last call. We offer the knowledge, experience and resources that few companies can match. No matter what type of insulation you need for your garage, you can rely on us for on-time, affordable installation. To learn more or get a free estimate from our team, give us a call or contact us online! Our insulation team installs batt and blown-in fiberglass. American Insulation is proud to be a leading installer of spray foam insulation. 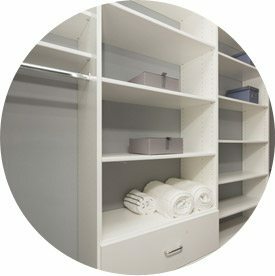 American Insulation installs quality shelving and storage solutions. American Insulation offers a large assortment of shower doors. American Insulation offers bath accessories for every taste. American Insulation is proud to be a leading installer of fireplaces. We have the right locks, handles, hinges and other hardware for your project. You are about to leave this American Insulation and enter a third-party site. American Insulation and Installed Building Products have no control over, and accept no liability, obligation, or responsibility for, the contents or performance of other websites. Any such link does not constitute an endorsement or any representation regarding, the linked website, its content, its owner, its performance, its owner’s products or services, or any forward-looking statements found in.